I have been feeling rather grumpy lately… about two weeks ago our electric shower died and I was forced to use the bath instead. I found a plumber and he quoted for a new shower and sorting out the long-failed element on our back-up immersion heater (the main one was fine). He arrived eight days later and fitted the shower, but couldn’t do the element as he’d mislaid some particular sort of wrench he needed. Unfortunately, by the time he discovered his loss, he’d drained the water tank. So, rather than waste water he left it empty, promising to come back in a few days to finish the job. This meant I could use the shower, but had to boil the kettle to do the washing up… and I couldn’t have a bath (not that I wanted one after so many in the previous 10 days). He was as good as his word and turned up today to replace the element. Everything is sorted out now and from tomorrow (our water heats over night) I will have my choice of shower or bath and I will be able to wash dishes/the floor/the car/the greenhouse to my heart’s content. Even better, the cost was remarkably low. A great result, but one that has got me thinking. Here in the UK we take our good fortune for granted. We expect to have hot water… from multiple sources… and in general we get it. We expect to be able to turn on a tap and be provided with as much treated water as we desire. We take it for granted to such an extent that most of us use this treated water (produced at the cost of energy and resources) to dilute our waste. And then we send it down the drain with no further thought of what will happen to it, namely more costly treatment to make it safe to discharge into the environment. I was most concerned, therefore, to read recent reports on the web saying that the CEO of Nestlé did not consider water to be a basic human right. It’s hard to work out the exact truth behind this story, but in 2005 Peter Brabeck-Letmathe the CEO of Nestlé at the time stated that NGOs who declare that water is a human right are taking an extreme view (you can see him say this on this video, from about 2 minutes 25 seconds – it’s in German, so I’m relying on the accuracy of the subtitles). Of course his remarks have been addressed by Nestlé, who now state on their web site that ‘He is, and always has been, arguing for more efficient water management by individuals, industry, agriculture and governments.’ Whatever Mr Brabeck-Letmathe meant, the whole thing highlights the conflict between the rights of individuals and the demands that large corporations (whose main function is to make profits for their shareholders) place on scarce resources. So, however much water falls on me from the sky here in west Wales and however much I might moan about one of my sources of water failing, I will try to remember that other people do not have access to clean water, let alone hot water. With this in mind, and since the plumber cost less than we expected, I have just made a donation to Water Aid… perhaps you might consider doing so too? I’m trying very hard to support small producers and have really cut down on buying from the big guys like Nestlé, but sometimes it’s all too easy to be lazy or mislead when a formerly independent producer has been taken over by one of the biggies. Still,if we all try to be more thoughtful with our purchases, we can make a huge difference collectively. I was living in Virginia when Hurricane Isabel came through. http://en.wikipedia.org/wiki/Effects_of_Hurricane_Isabel_in_Virginia She wasn’t a huge hurricane, but we were two weeks without power. That meant no hot water, a freezer full of food we had to throw away after three days because there was no way to keep it and no way to cook it… and all kinds of things that I wasn’t prepared for. After a week of ice cold showers, I rented a motel room for myself and my girls (just for the day because I was poor as sin) just so we could take hot showers and watch some television and have air conditioning for one night. September in Virginia is HOT and humid. All in all, I’m glad that the plumbing still worked at all. It wasn’t the first time I’ve been without power, but it certainly was the longest. Well, except the motorhome thing, but that was voluntary. Ha! I’m very grateful that I don’t live in an area prone to such natural disasters – I cannot imaging the stress you and your girls went through. I hope you never have to experience anything like it again… at least you’re safe from hurricanes in Seattle! Nope, no hurricanes here. Here we are surrounded by volcanoes Mount Rainier is a beautiful mountain that is also a volcano… and we’re also prone to earthquakes (and tsunamis if we live too close to the coast, which I don’t). Oh, and mudslides, let’s not forget the mudslides — depending on where one lives around here. All this rain is bound to saturate the ground you know. ^_^ There’s no place on Earth that’s “safe” from natural disasters. Hurricane Isabel just taught me to be prepared. Here in Australia we have, as you may remember, water ‘issues’. Either too little – some areas have been drought declared for over 6 years – or too much, with state-wide flooding. We’ve had some of that here, and the stupidly ironic thing is that when there’s water standing knee deep in the street, we can’t use the stuff in the tap because of contamination. We’re lucky to have 20 solar panels on the roof, so power and hot water are fairly constant. We are starting to get cyclone-season preparation warnings on TV now, which include suggestions for water storage and human waste management in the event of a disaster. Personally I’d welcome the reinstatement of rainwater collection tanks for potable water and ‘long-drops’ (preferably not in the same corner of the garden!) to avoid reliance on reticulated water and sewage systems, but I’m a bit of a Luddite in that respect! Uneven distribution of water is such a frustrating problem… if only there could be ‘enough’ available to everyone. I keep thinking about your dad’s composting toilet. When we get our bathroom refitted I will certainly be looking at the modern water-free options. The less we contaminate our water, the better and this seems like the best way to achieve that at home. I’m glad things are back up and running for you and that it didn’t cost the usual arm and a leg. A donation to water-aid sounds a great idea. It has made me very happy… amazing how much better I feel to be able to start the day with a quick shower. WaterAid is one of my favourite charities, they do so much good and make such a difference to so many poeple around the world. I’ve not long returned from travelling in Tibet. I think Tibetans probably fall into that 2.5 million you mentioned without adequate sanitation. Our “sanitation” experiences ranged from no bathrooms in our guesthouses the further west we went ie no showers for a week or more, to having a bathroom but often just a trickle of water and definitely not hot. Sometimes we were lucky to get a thermos of hot water….not ideal, as it meant precious fuel was used to boil a kettle for us…….for a warm face and underarm wash. Toilets were all some variation on the ‘squat’…..usually communal……and in some we had access to a barrel of water with a dipper for both toilet and self cleaning…….paper in the toilets was a no-no. Others were less than clean, quite revolting long drops, usually tucked behind a shoulder high wall in the main street….we often chose to wait and “go in nature” when we set off again. Clean drinking water was a whole other story! We were mostly able to buy bottled water, but then there’s the issue of plastic disposal, we all carried water purification tablets and filled our bottles from ‘clean looking’ and fast flowing streams……we knew the ‘clean’ was an illusion, as we could see that upstream were herds of yaks, usually standing around in the water flowing down to where we were. This is what the locals are drinking, untreated. 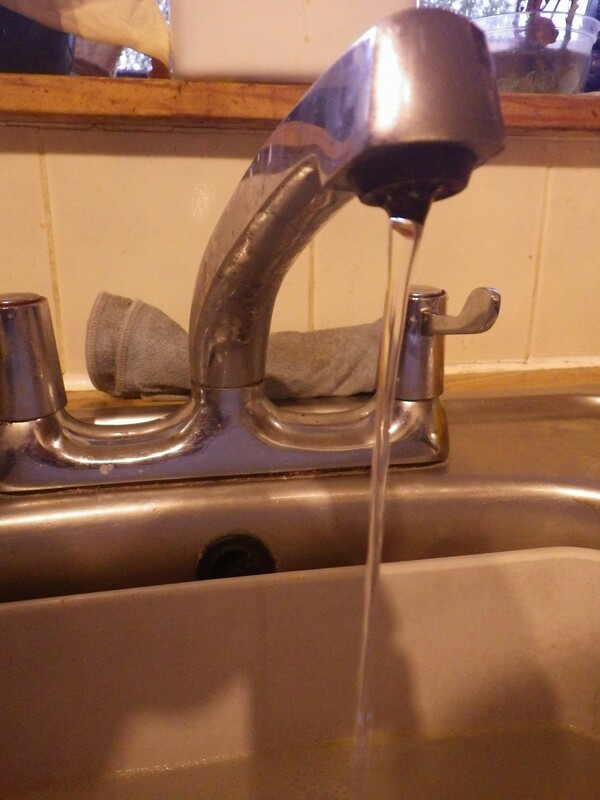 I’m very careful with water here at home…as Kate said, we have water issues here in Australia….but my Tibetan experience has made me even more aware and so grateful for being able to turn the tap on and there’s hot running water. I like your idea of a donation to Water Aid, so I’m seriously considering it. What an eye-opener to go to such a different culture. And what a difference it would make if no one needed to buy bottled water because there was potable water freely available everywhere. Think of the reduction in the use of plastics and transportation for bottled water; think of the improvement in health for so many people. Every penny we give to achieve clean water is also supporting a better environment so I hope many people will find a few pounds/dollars if they can to donate to WaterAid… thanks for considering it. Great post! One of the big reasons I’d like to own my own house is so I can put in proper water efficiency measures and not waste drinking water for washing and flushing. P.S. sorry for being so depressing. In better news I made chocolate cake today! I was thinking about you and about Peru as I wrote this post. It saddens me deeply that any country should contaminate its resources for the sake of profit. We’re back to the huge corporations vs ordinary folk again I guess. And we seem to be about to go down just this road in the UK, pumping all sorts of chemicals into the ground for the sake of ‘cheap’ fuel from shale gas. I wonder how cheap it will be considered when the groundwater is contaminated… but then the population will be left with the consequences and the investors and corporations will move on to the next source of profit. Sigh. I’ll try to focus on cake! This is a great post, both thoughtful and thought provoking! I have always thought the school curriculum should include a term long project IN a third world country for all 15-16 year olds. Where they get to live and work as the locals do. I think that could change the world in one generation! As I wrote it, this post metamorphosed from one about how nice it is to have a shower in the morning to something completely different! I think what I ended up with was probably more important to say. I love the idea of taking older children/young adults into a different culture… how much better we would all understand each other. Good to be reminded of how easy we have it here. our water can be heated three different ways, gas, woodstove and solar thermal though the reality is that because of different seasonable availability, there are few if any days when more than two are used. Because the woodstove is so good, our gas bill is actually lower over the winter months than in the summer. We might get an immersion element fitted to our thermal store water tank at some point along with a technical gizmo that will divert any spare capacity from our pv to it. With regards to water use, I am very aware of how much water we use in our gardens and while this year our two water butts and two IBCs have sufficed, they would not be enough in a drought year and so I must get around to using the water from the front of the house as well as the back roof. This would also get us around £50 reduction in our sewerage charge each year. So easy to be complacent! For water saving we have four water butts and one IBC and here in west Wales we rarely run out of water in the summer. I try to store lots of water in the soil too with high levels of organic matter in the raised beds thanks to having trained the neighbours to give me their grass clippings! Great post, and thank you for the Nestle link. Sometimes I struggle to find information on what some of these large corporations are doing so it’s great to find out more about this. No problem. I often see stories (especially on Facebook) that report terrible things, but I have started following them up more. Headlines can often be misleading I I want to know the truth. The one about the Nestlé CEO is much more complex than it first appears. Having said that, big corporations are driven by profit and that’s something always worth bearing in mind. It’s very confusing because I just looked on the Nestle website and found commitments to environmental sustainability and the elimination of child labour (but only in key commodities). It just goes to show that it’s hard to see what’s going on behind the face of these companies, whatever they say. But yes, they are a big corporation and that will always have an effect. After watching that video I actually felt quite sick that someone could face a camera and say those things. My going green journey hasn’t been much focused on food yet as I was a bit overwhelmed by it, but I really think I’m going to try and make it a priority after this. We (in the UK) don’t use our hot water tank- we use so little hot water that it seems a waste to heat up the whole tank of it when we’re not home all day (and it takes years to get the hot water to the taps as the pipe runs in our house are odd). We have an electric shower so that heats itself up, then boil the kettle for washing up (or in winter use a kettle on the log burner). Morning face-washings are cold and bracing! Like you and some of the others, we had a water wake-up call a few years ago. Long story, but I NEVER take a shower now without appreciating the availability of hot, plentiful water! Brilliant blog, reminded me about how easily we can take things for granted. We cut back Nestlé products way back in the 70’s when they tried to get people in third world countries to use their dried baby milk powder, claiming it was better for baby than breast milk. Which was patently wrong as mums were having to mix it with contaminated water and because it was so expensive using less than the recommended amounts. Hence many babies fell ill and were undernourished. You are right it is sometimes hard to get to the truth behind the headlines and we don’t always have time to “poke about” for more information. On a lighter note I know from taking children on Outdoor Activities from schools and Cub/Scout Camps that they have very little understanding of just how much water we use in a day. When it had to be carried from a stand pipe, it was a salutary lesson for them that EVERY drop we used to wash, cook and drink with had to be fetched by someone. Mind you some of them then used that as an excuse not to wash!! I also have an on going battle with people to stop them using bottled water here, Wales, as the “council pop” is safe to drink and the water used to create the bottles is lost for ever and we then spend a fortune on getting the darned things recycled. Carrying your own water for the day is a great idea… although I have no problem imagining some of the children I know foregoing washing!